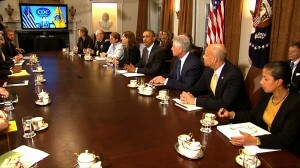 WASHINGTON — President Barack Obama says the U.S. must be guided by science – not fear – as it responds to Ebola. In his weekly radio and Internet address, Obama says he was proud to give Texas nurse Nina Pham a hug in the Oval Office after she was cured of Ebola. He says the other nurse who contracted Ebola is also improving. Obama is praising New York’s quick reaction to its first Ebola case. He says he’s promised local officials any federal help they need. Obama is reminding Americans they can’t contract Ebola unless they come into direct contact with a patient’s bodily fluids. The president says the U.S. can beat the disease if it remains vigilant. He says the best way to stop it is at its source in West Africa.